Virgin Galactic is planning to send its second SpaceShipTwo, an air-launched suborbital space tourism plane called VSS Unity, to “space for the first time.” A test flight will occur between December 13 and 15 depending on the weather, according to an official statement. VSS Unity’s design and method to get into space is unusual: a mothership called White Knight will bring it to 50,000 feet (15,000 meters) horizontally, like a plane. Then it’ll disconnect and rocket off using a specialized hybrid rocket engine to accelerate it to space. But what exactly does Virgin Galactic mean by “space?” At what altitude does “space” begin? The answer is trickier than you might think. The upcoming test flight will burn the SpaceShipTwo’s rocket motor for longer than ever before — but the space company didn’t give exact figures. 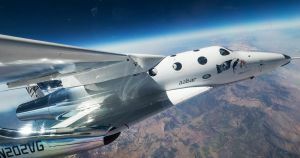 Space News suggests that Virgin Galactic could be referring to “space” as an altitude of 50 miles (80 km) — which is what company officials have previously stated. That’s the altitude at which NASA astronauts get their special badge — commonly known as “wings” — signifying that they’ve completed space travel. But then there’s the Karman Line at 62 miles (100 km) — the widely agreed upon boundary where Earth’s atmosphere ends and outer space begins. But even that is about to shift by another 12 miles (20 km) closer to Earth thanks to new calculations. So could Virgin Galactic be going to space? The space tourism company wants to eventually take the VSS Unity to an altitude of 68 miles (110 km). We have yet to see how the Unity’s upcoming flight will go — or what altitude it will reach. But it will be a while until Virgin Galactic can truly offer a trip to “space” for paying customers. Even at SpaceShipTwo’s planned maximum altitude, it’s still a long way to the International Space Station, which is orbiting at over 253 miles (408 km). More on Virgin Galactic: Virgin Galactic Will Send People to Space By Christmas. Maybe.